Welcome Home!!! To this spacious 3 bedroom, 2 full bath raised ranch with a GREAT Great Room, complete with sky-lights that offer plenty of natural light, beautiful wood floors, jetted tub and a gas fire place for cool fall nights! You will find the Great room leads to an oversized deck, perfect for summer bbq&apos;s. Kitchen and dining are conveniently located off of the Great Room and all of the bedrooms are located to the far right of the house. You will find lots of character through out this home, from the detailed crown molding, built-in&apos;s, and the beautiful stone hearth in the lower level. The hearth has a pellet stove used to heat the house for the cooler months. The family room in the lower level has a sliding glass door that will bring you to the private back yard and over to the heated in-ground pool. A home perfect for entertaining. A bright, level lot that is surrounded by water works property. 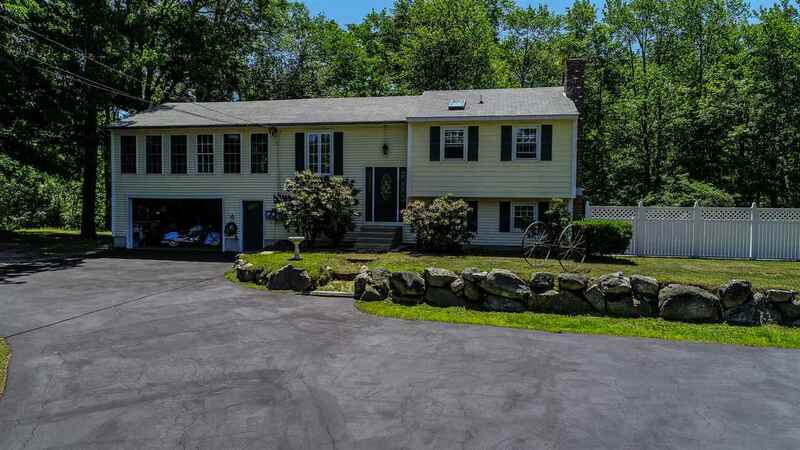 Close to shopping, route 101, and route 93. Even closer to local trails for snowmobiling, horseback riding, or mountain biking.